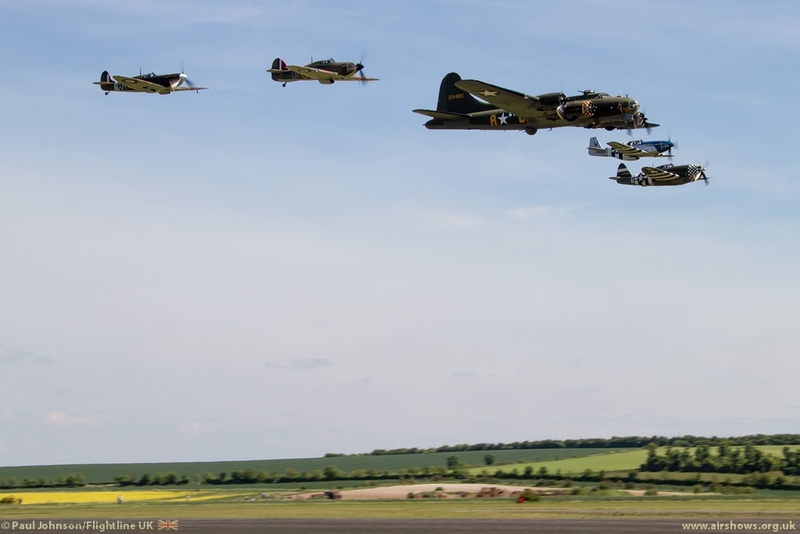 Duxford's first show of the season was a very special playing tribute to the 70th Anniversary of the USAAF Eighth Air Force's arrival at the Cambridgeshire airfield. 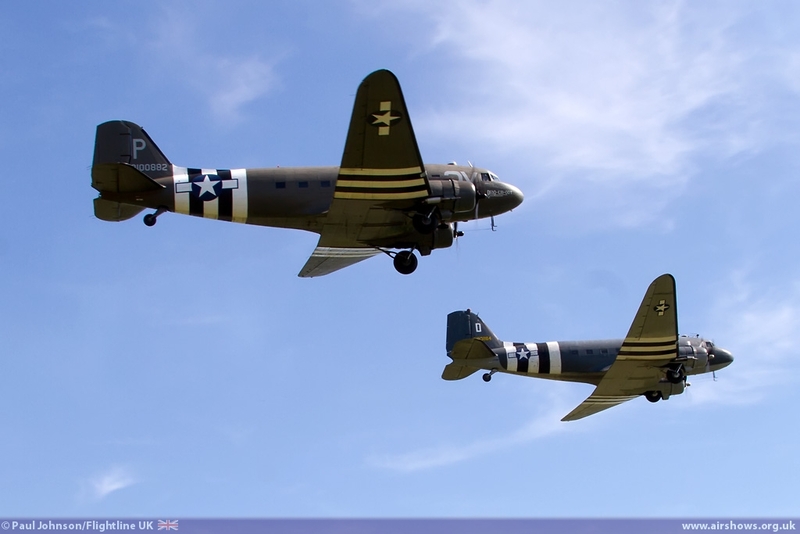 The day had a distinctly American feel both in the air and on the ground. 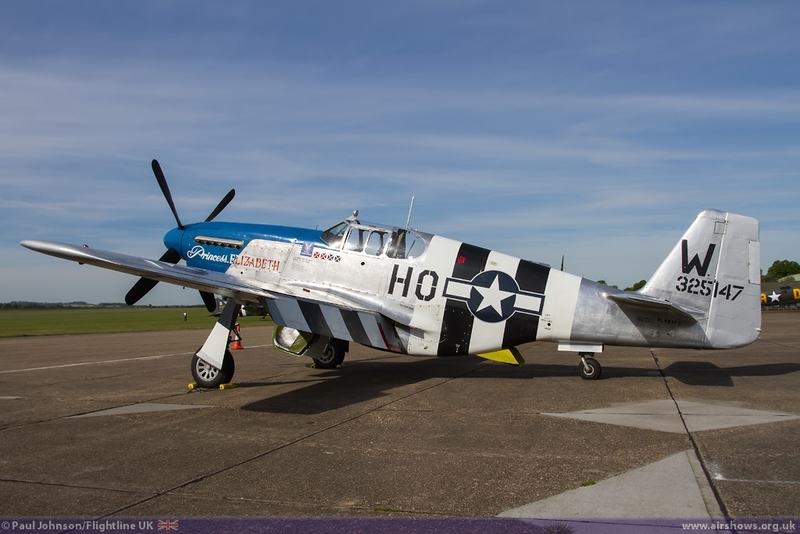 Stars of the day were the 'Eagle Squadron' – a four ship of Spitfire, Hurricane, Mustang and Thunderbolt that not only represented the American contribution to the European air war, but also the wartime time history of Duxford. 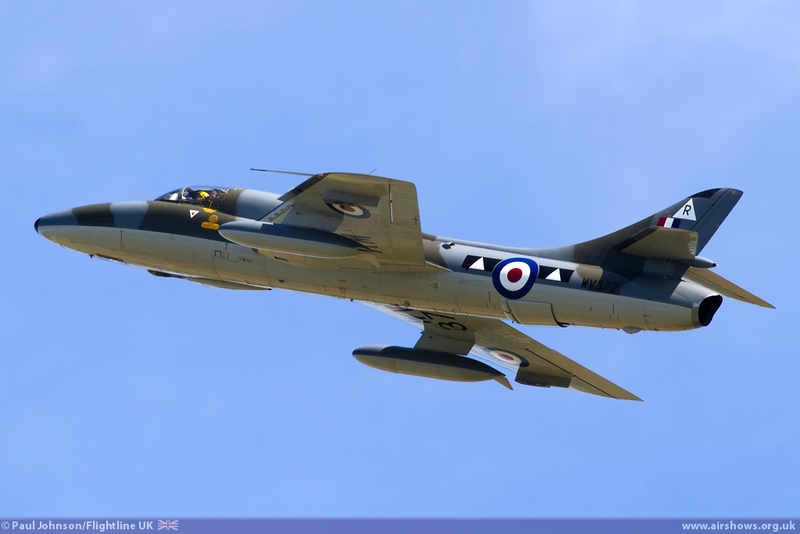 There were also significant contributions from classic jets, civilian and military display teams. 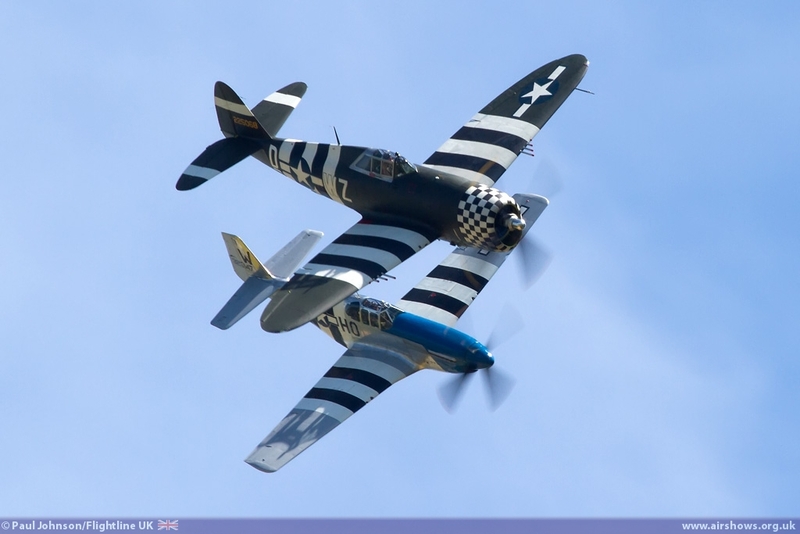 For many, Duxford marks the first major air display of the year. 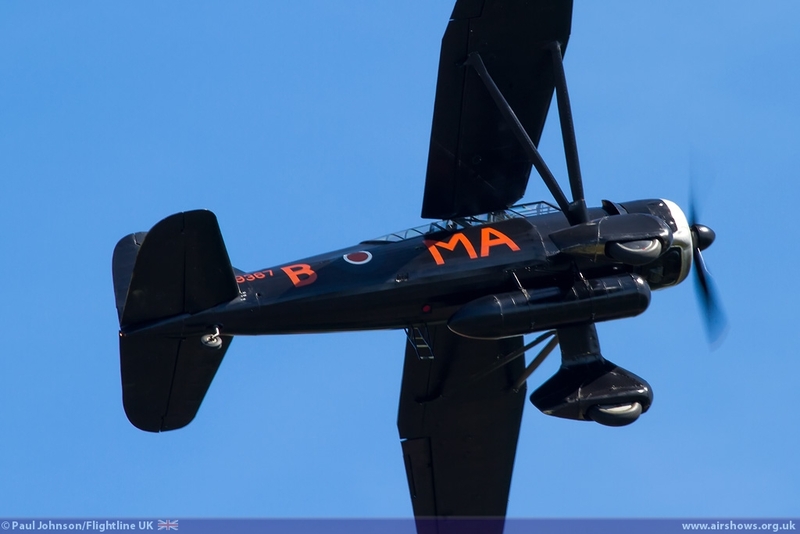 Duxford's Air Shows are always very special as in their own way, they mark some very important anniversaries in aviation and wartime history. 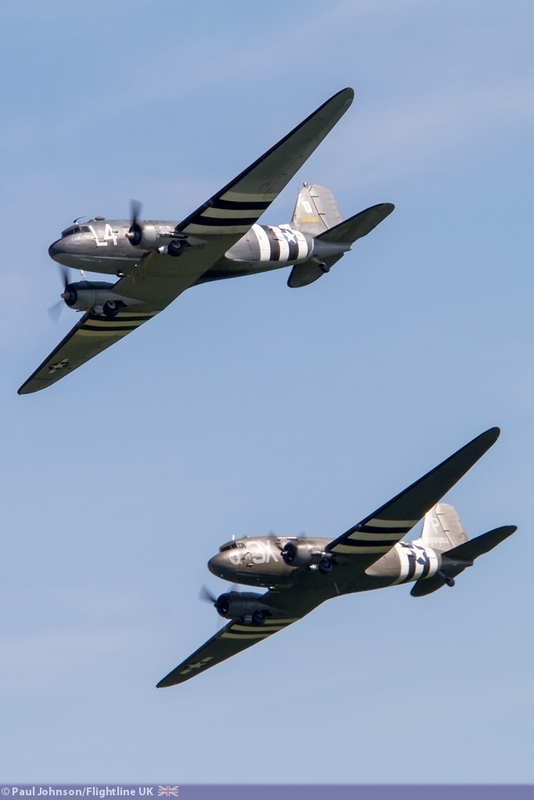 The Spring Air Show however was particularly special and poignant to Duxford itself marking the American contribution not only to the European Air War as a whole, but particularly to Duxford itself. 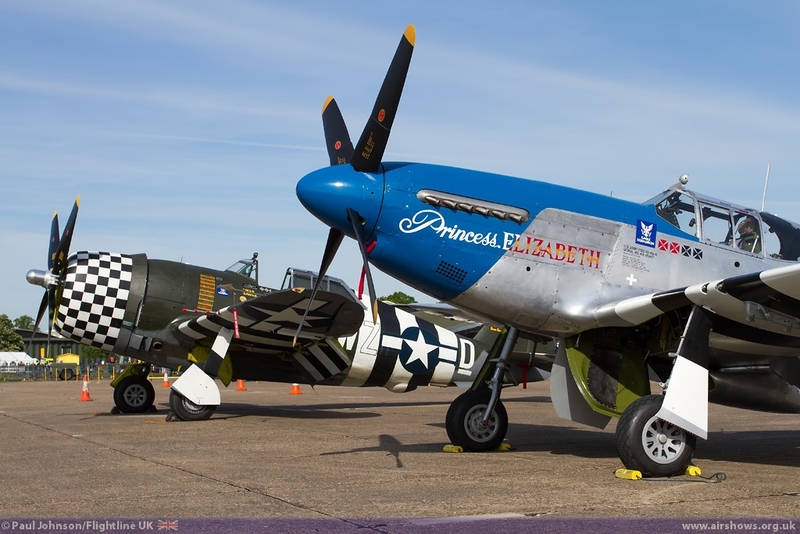 1943 saw the arrival of the 78th Fighter Group of the United States Army Air Force to Duxford and the show was held 70 years to the day that King George VI and Queen Elizabeth visited the 78th Fighter Group at Duxford. 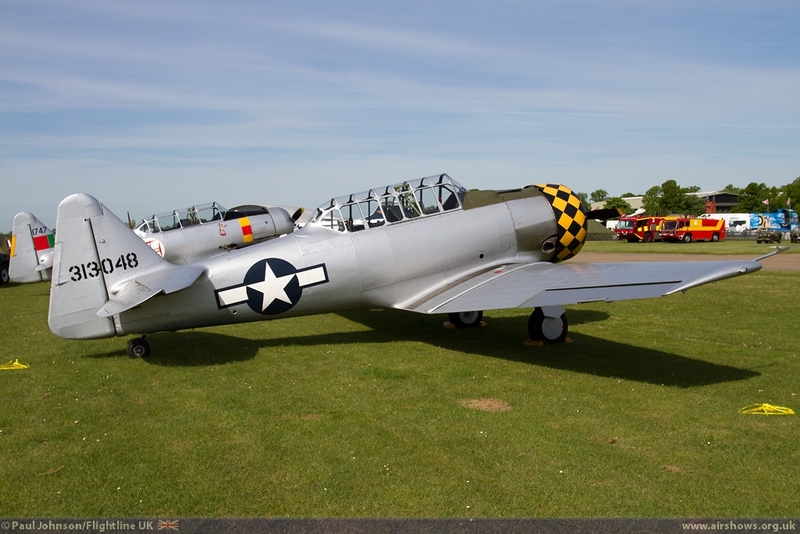 The Americans arrival at Duxford not only affected the immediate area of the airfield, but also the wider local East Anglian community and this has never been forgotten. 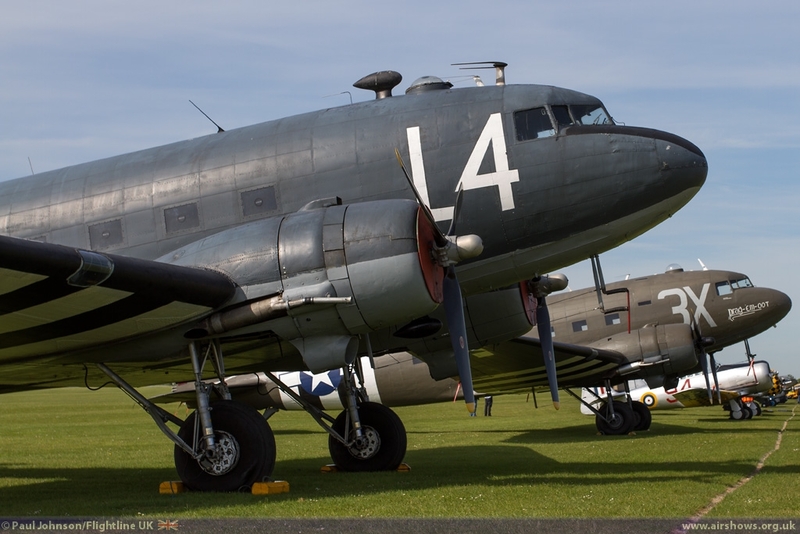 Surrounding Duxford, there are many relics of the old American bomber and fighter stations and of course, just to the east of Duxford is home to the current USAF with RAF Mildenhall and Lakenheath hosting the 100th Air Refuelling Wings and 48th Fighter Wing. 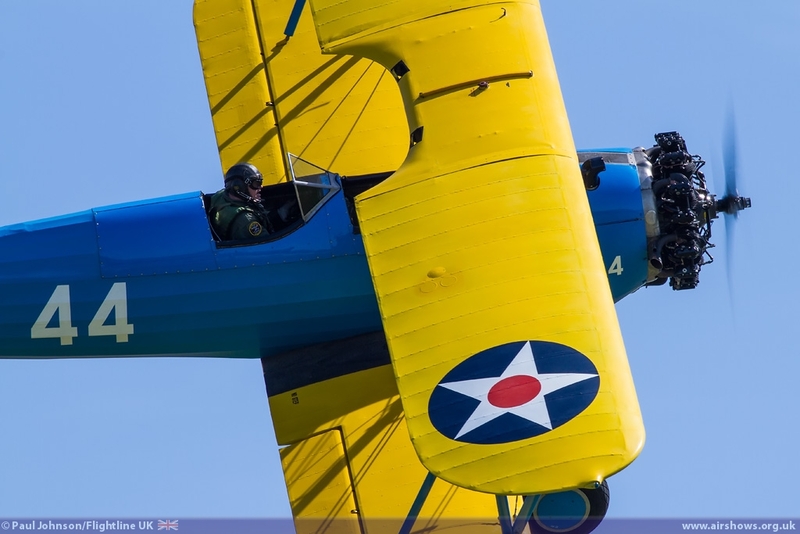 Before the main flying display even began, there was a special flying moment. 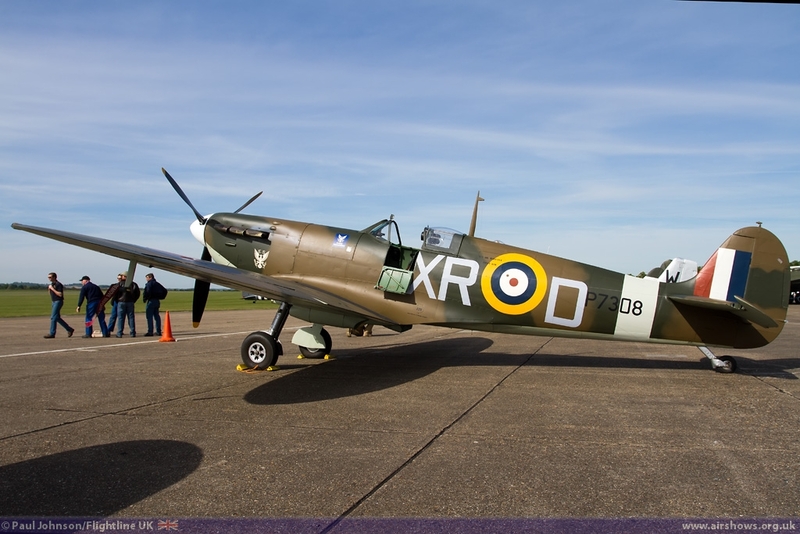 The guest of honour for the Eagle Squadron was Col Clarence 'Bud' Anderson. 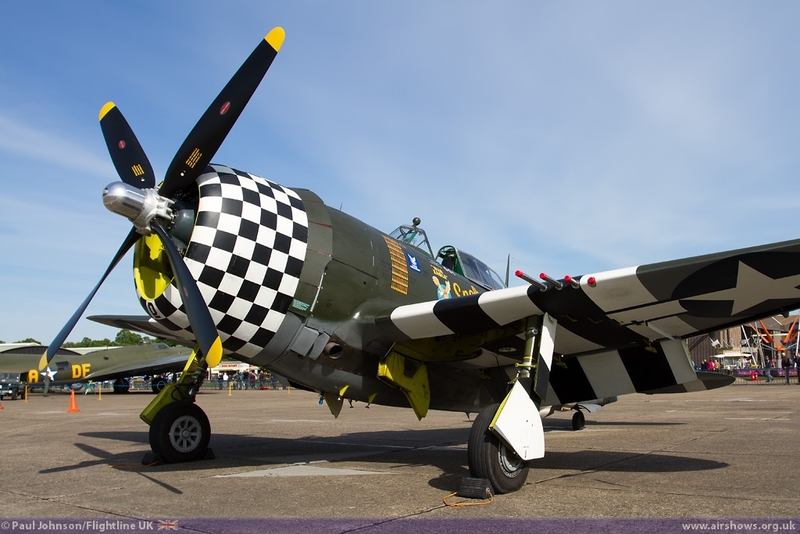 'Bud' is a Second World War 'triple ace' and flew two combat tours with the 357th Fighter Group based at RAF Leiston in Suffolk and continued his military service for 30 years. 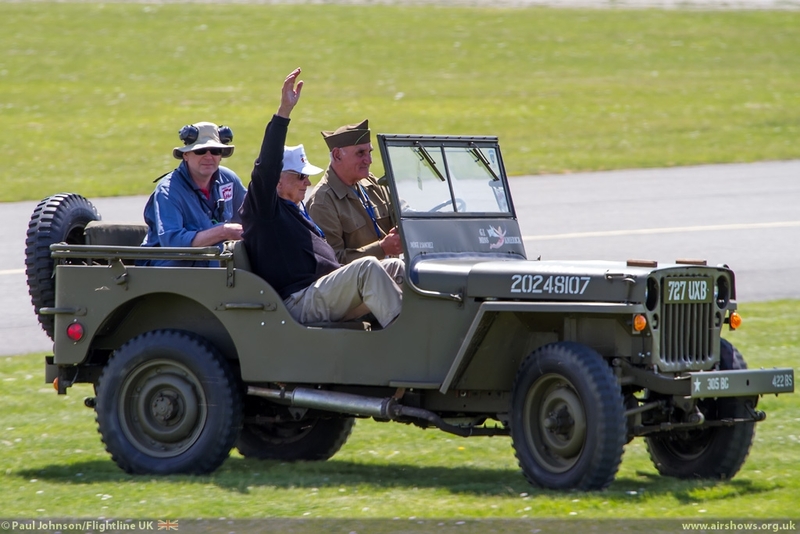 He was taken for a flight in TFC's TF-51D Mustang 'Miss Velma' prior to the show before making a crowd-line appearance in a Willys Jeep. 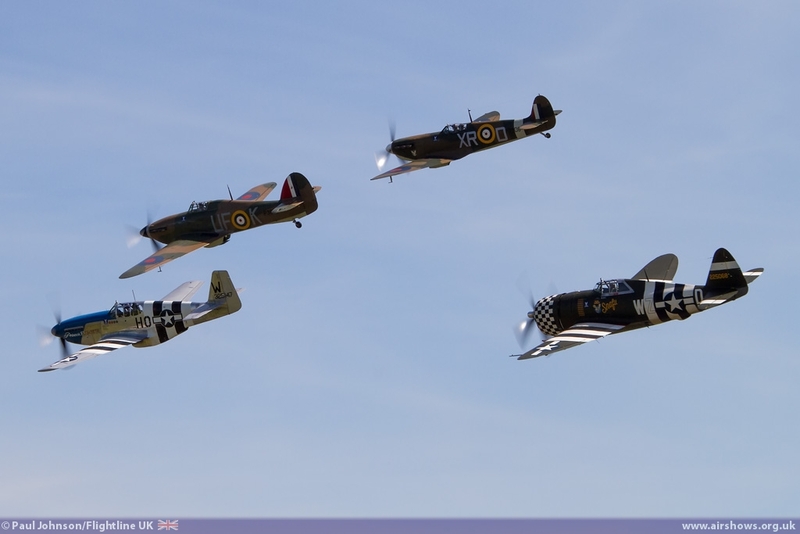 The centre piece of the afternoon was the 'Eagle Squadron', a unique formation of warbirds comprising of Supermarine Spitfire I AR213, Hawker Hurricane AE997, P-51C Mustang 'Princess Elizabeth' and Republic P-47G Thunderbolt 'SNAFU.' However, their involvement was far from normal. 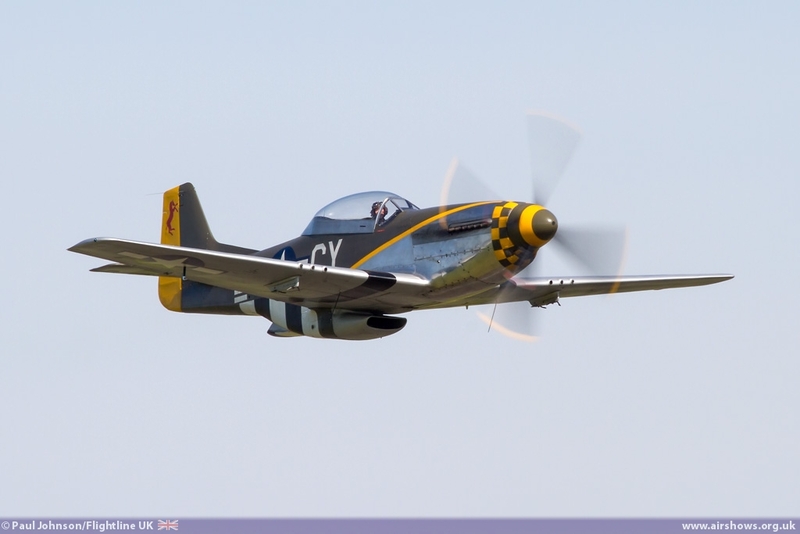 The P-51C was brought over from the US by Comanche Warbirds just to take part in the Eagle Squadron. 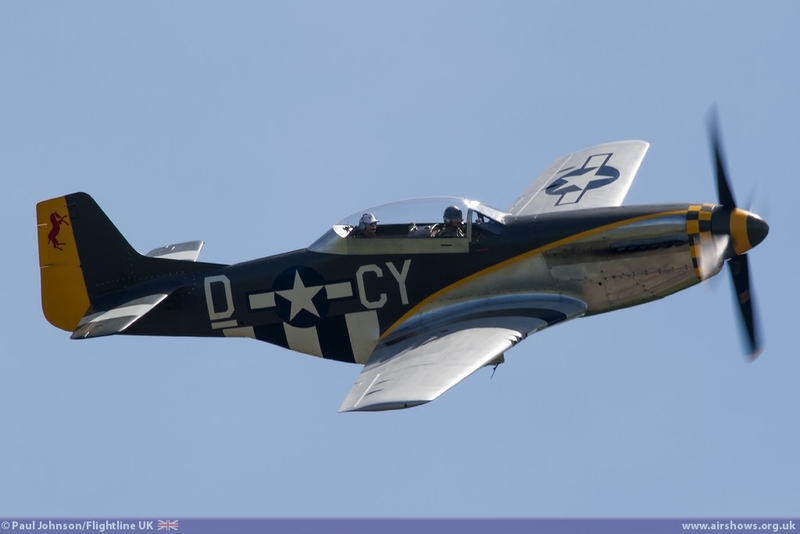 It was previously a Fighter Collection aircraft so it was good her back, particularly as she is regarded as one of the best looking examples of the Mustang. 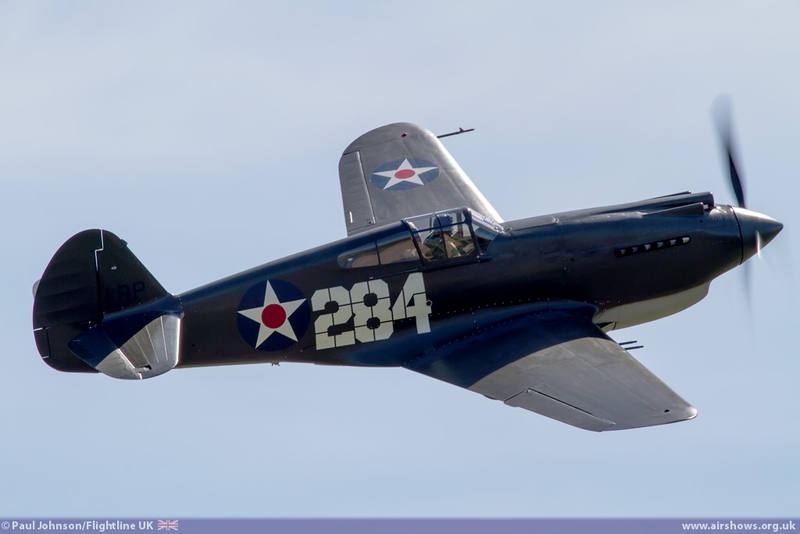 The colours represent those of 1st Lieutenant William T Whisner of the 487th Fighter Squadron, 352nd Fighter Group during the D-Day landings in 1944. 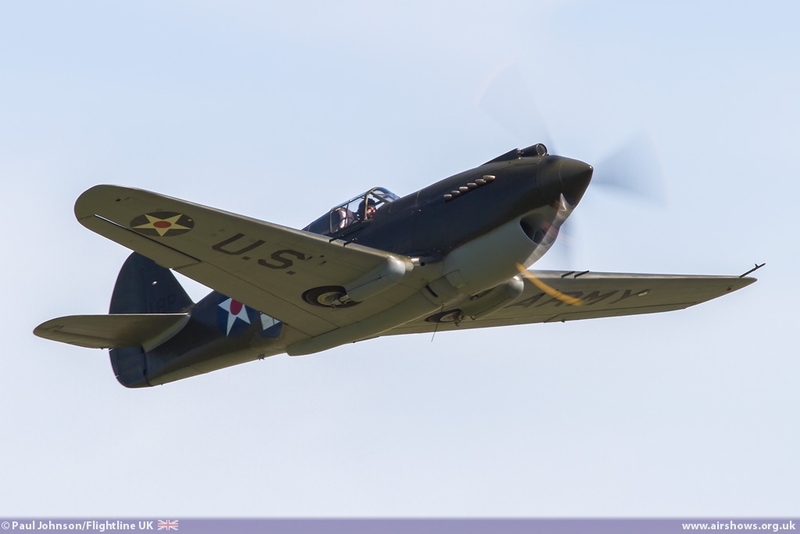 The original aircraft was lost during D-Day when Lt. Robert Butler was shot down by ground fire but managed to bail out. 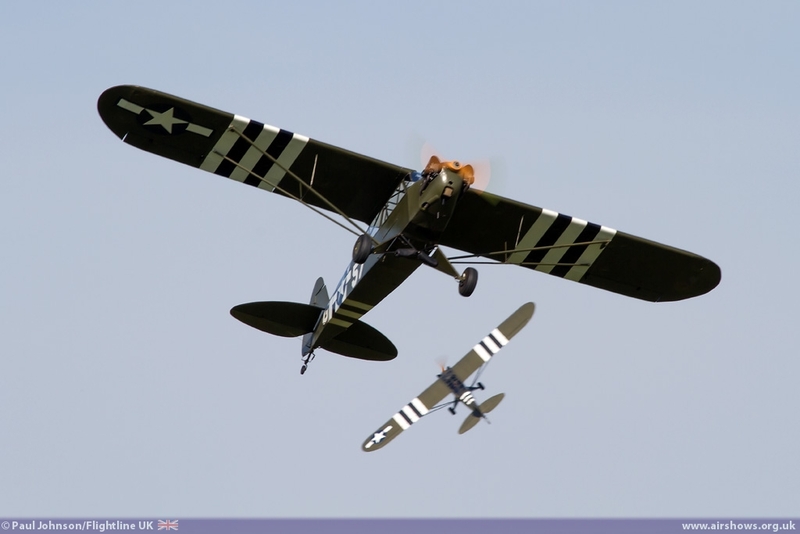 Whisner himself survived the war becoming an ace. 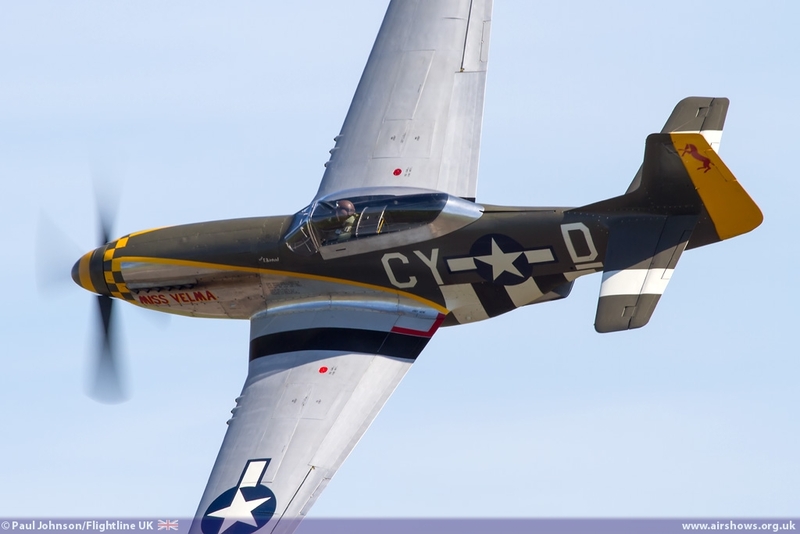 He also became an ace during the Korean War and is one of only seven pilots to reach ace status in both conflicts. 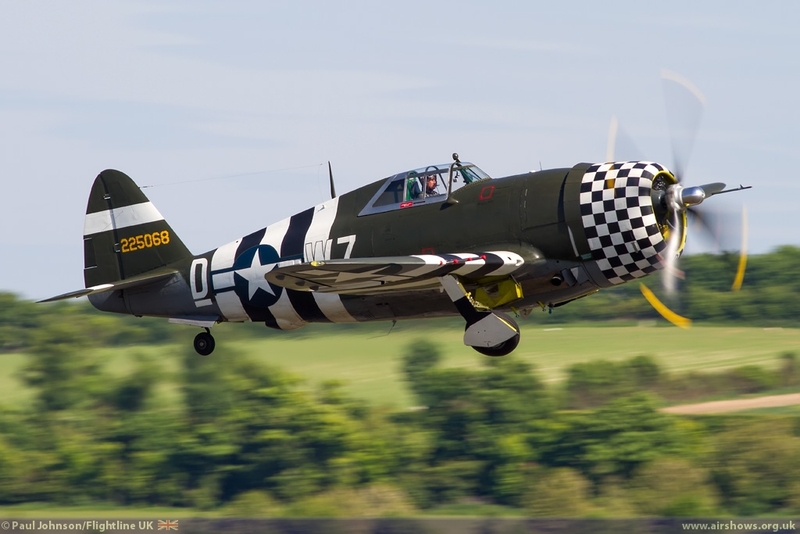 The Fighter Collection themselves provided their P-47G Thunderbolt which is another stunning looking aircraft in her 78th Fighter Group colours. 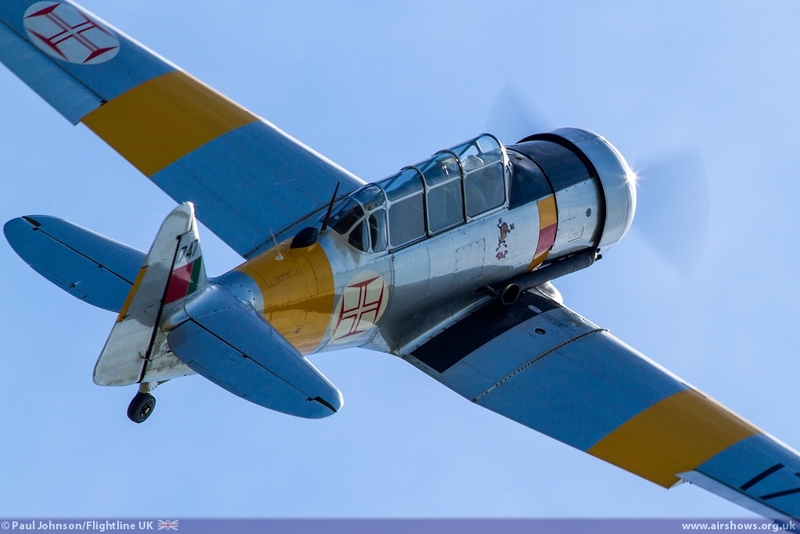 Specifically, she wears the colours of SNAFU, the regular aircraft 1st Lt Severino B Calderon. 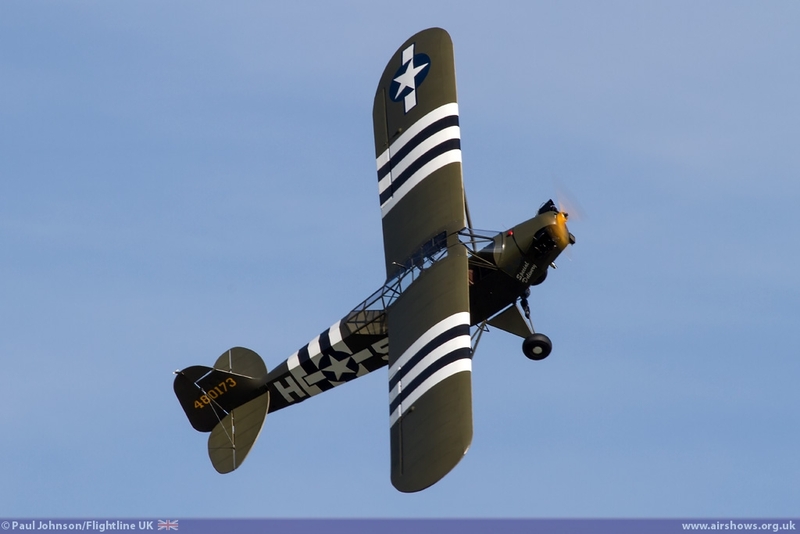 He survived the war flying with the 78th before transferring to the 56th FG. 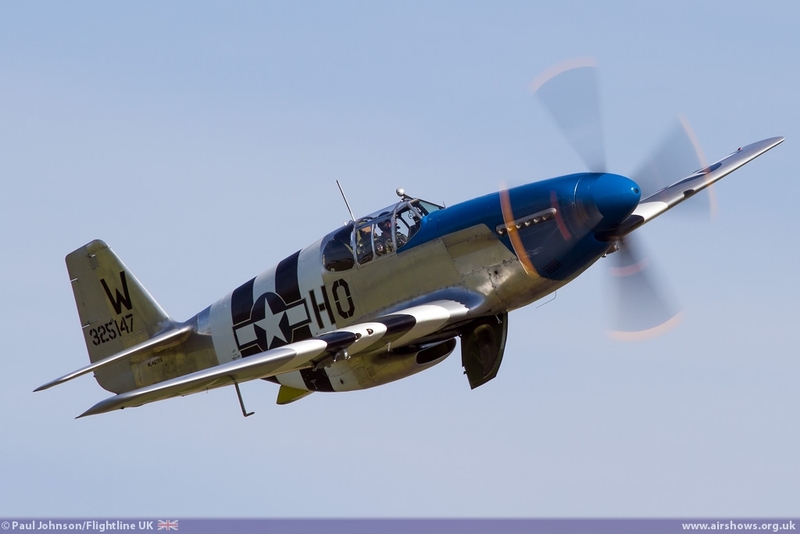 Tragically he was killed flying a P-51 in 1946. 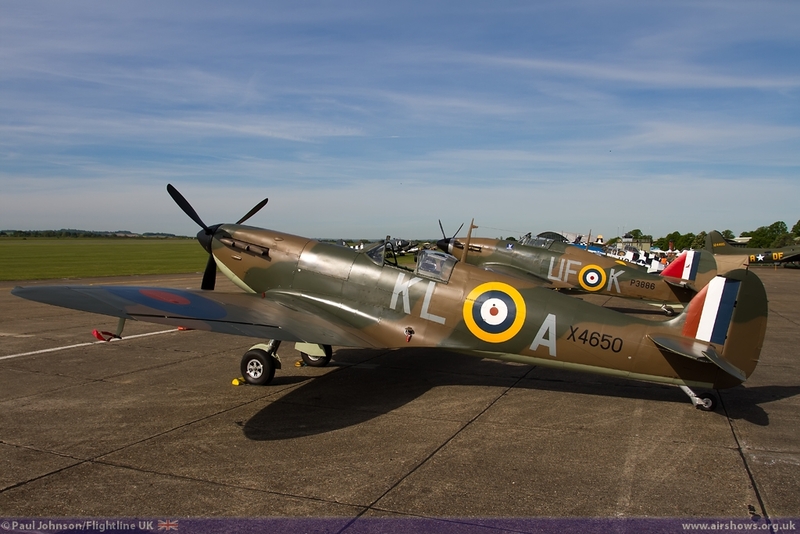 The Spitfire and Hurricane too were remarkable participants as they had both received new colours specifically for Eagle Squadron. 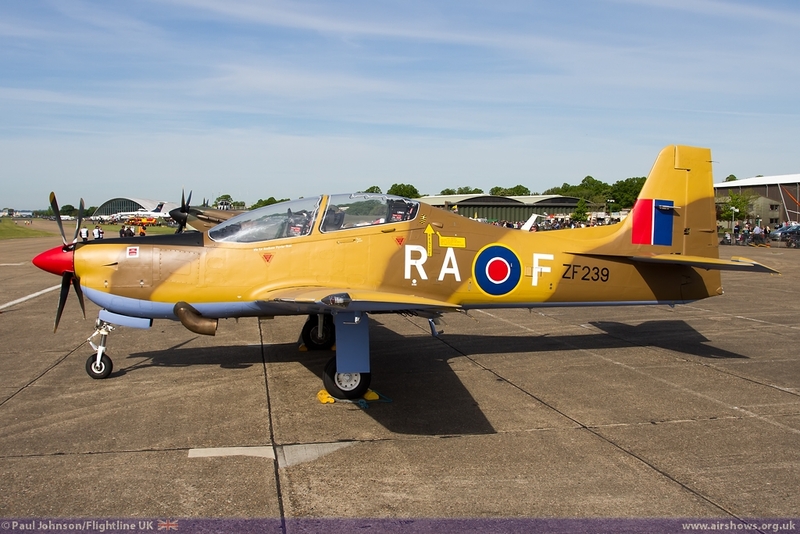 Spitfire Ia AR213 has been repainted in the colours of Spitfire I P7308 of 71(Eagle) Squadron flown by American ace Pilot Officer William Dunn. 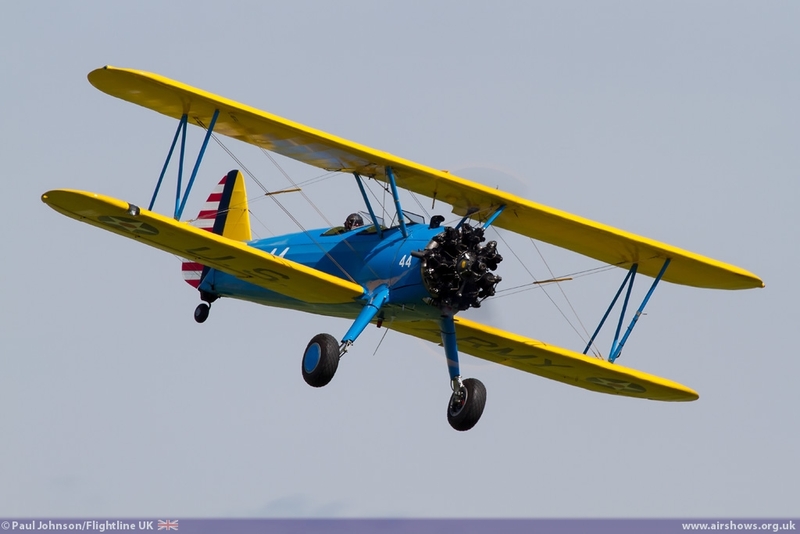 Bill grew in in Minnesota and wanted to fly. However he ended up in infantry units twice, first in the US and then in Canada. 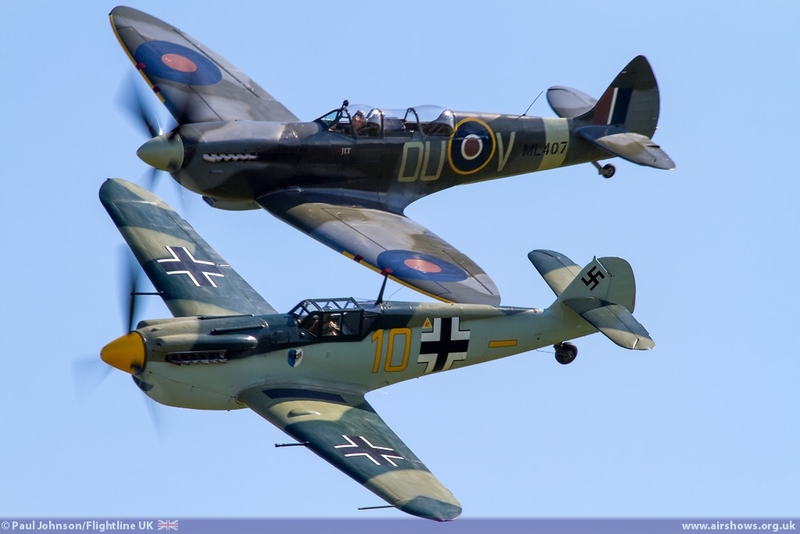 At the outbreak of war the Royal Canadian Air Force was not accepting pilots so he joined the army and was sent to England. 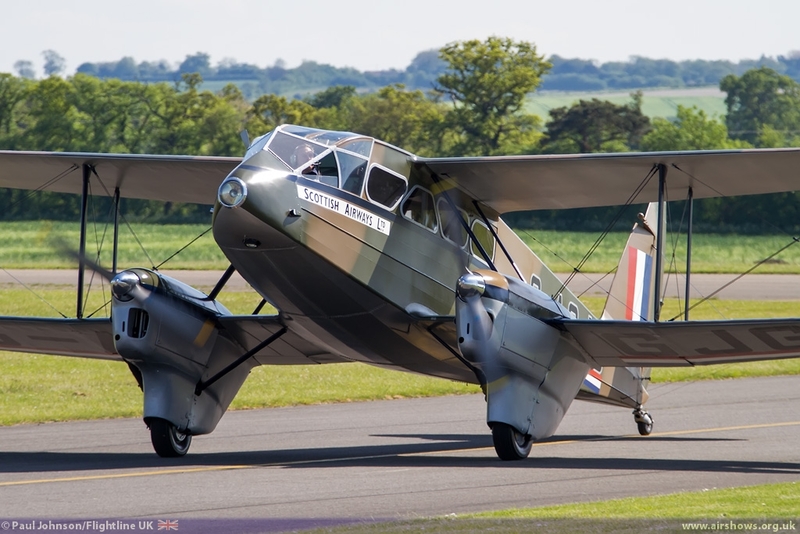 However, once he arrived in England, the Air Ministry was soon sending out requests for experienced pilots (with 500hrs.) Bill only had 160 hours but according to his memoirs his pencil 'slipped' on the application form. 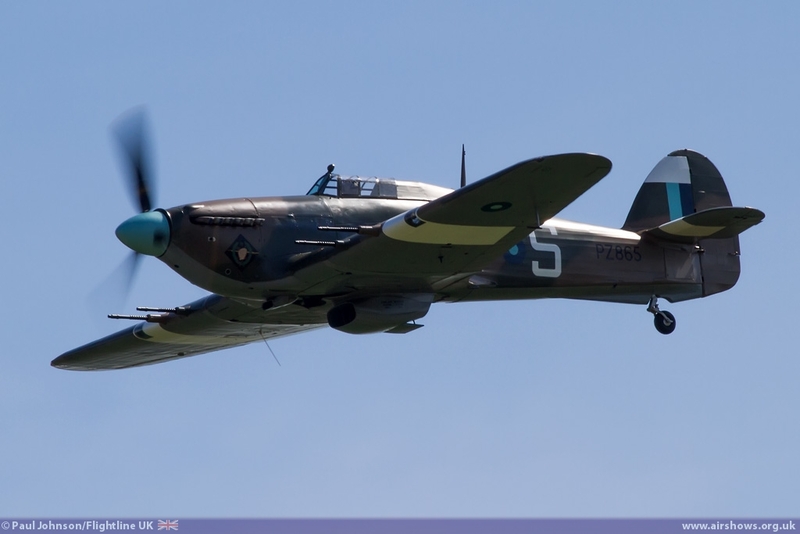 After just four days of training Bill was sent to 71(Eagle) Squadron initially flying the Hawker Hurricane before re-equipping with Spitfires. 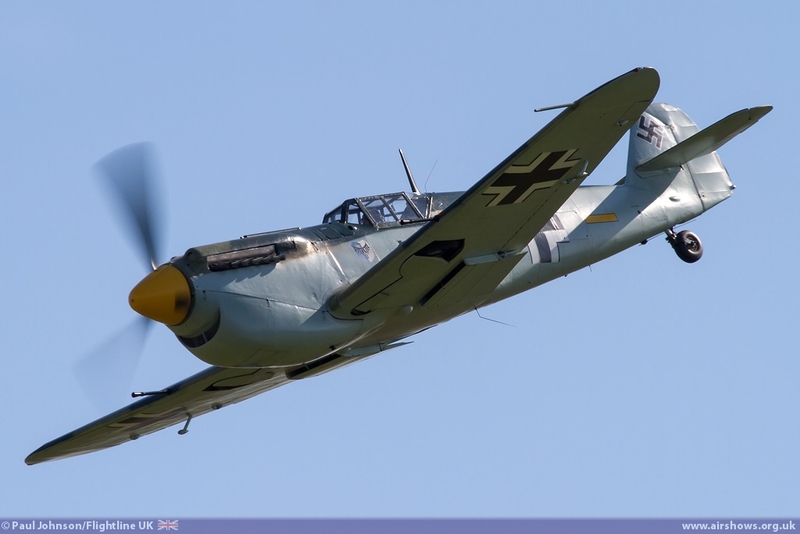 Bill was injured in combat on 27th August; in the same flight he had shot down two Bf109s. 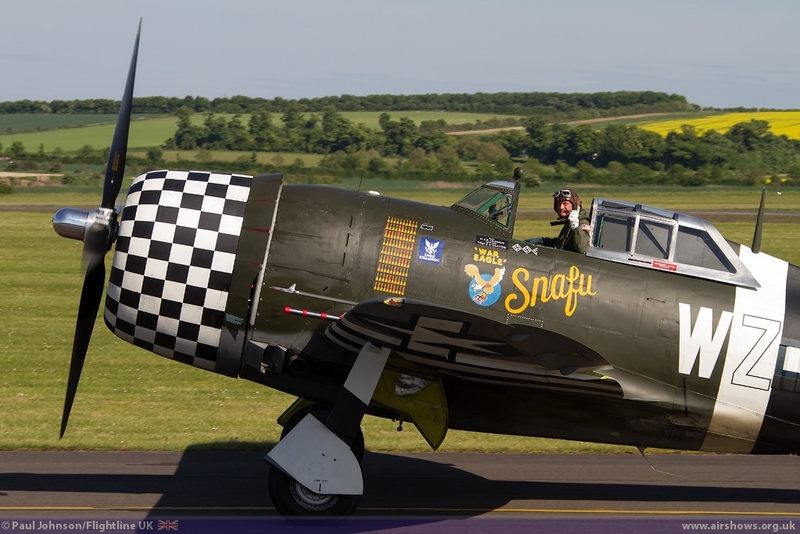 He was the first Eagle Squadron, and the first American ace of the war but his injuries put him in hosptial for several months. 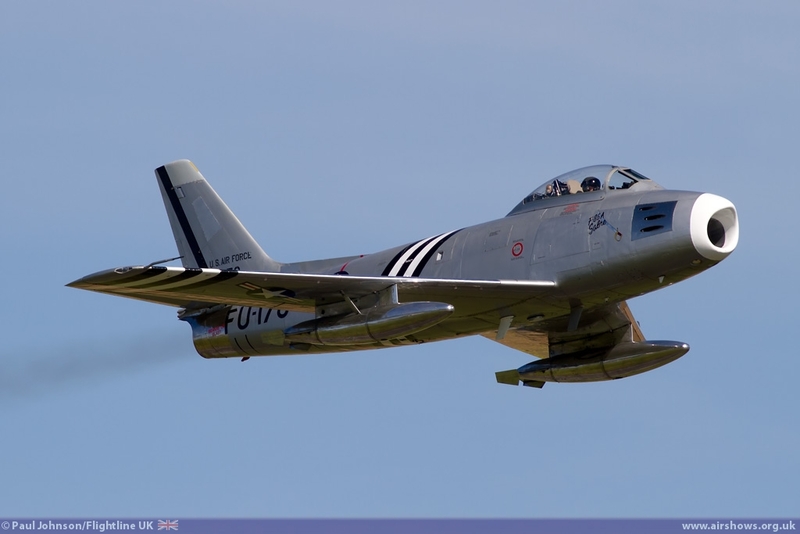 Following leave he was posted to instructional duties in Canada before joining the USAAF in 1943 and flying P-47 Thunderbolts with the 9th Air Force. 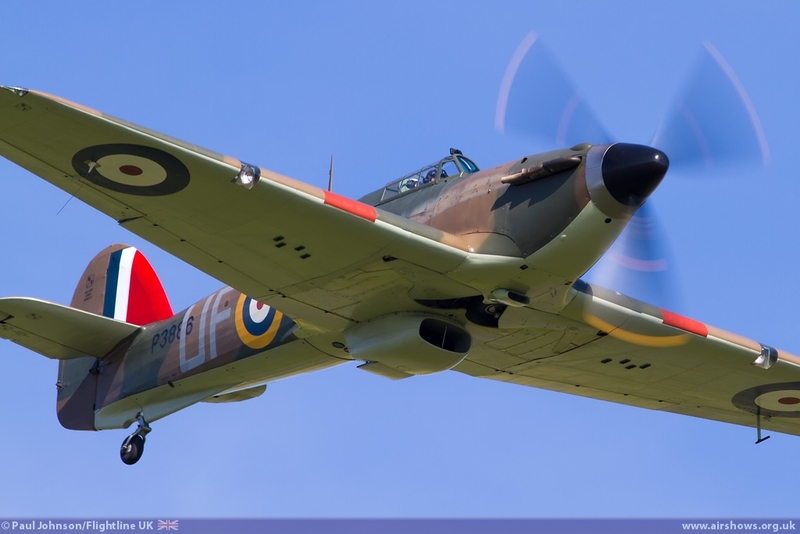 The Hurricane wears the colours of 601 (County of London) Squadron coded UF-K. 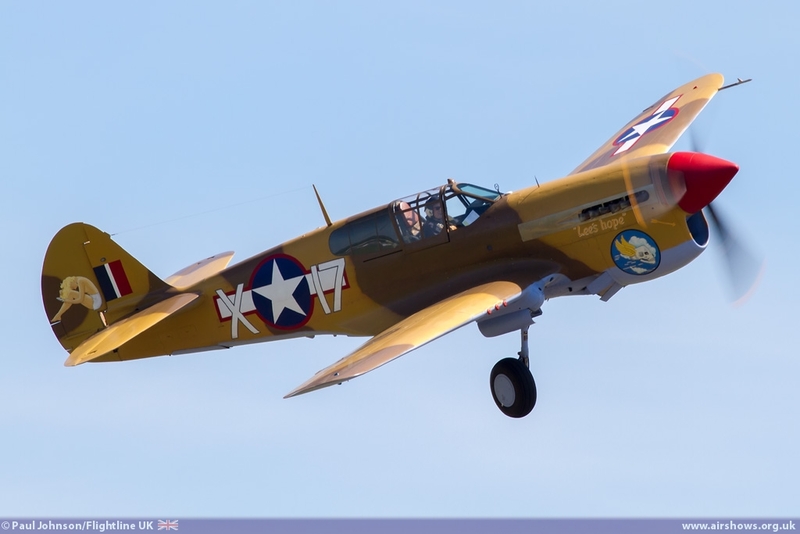 This aircraft was flown by two American pilots, Billy Fiske and Carl Davis. 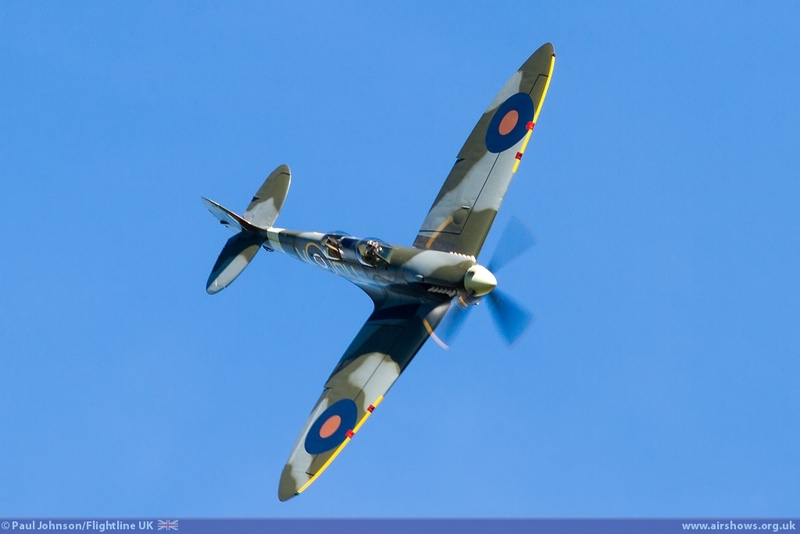 Billy was one of only 11 Americans that fought during the Battle of Britain. 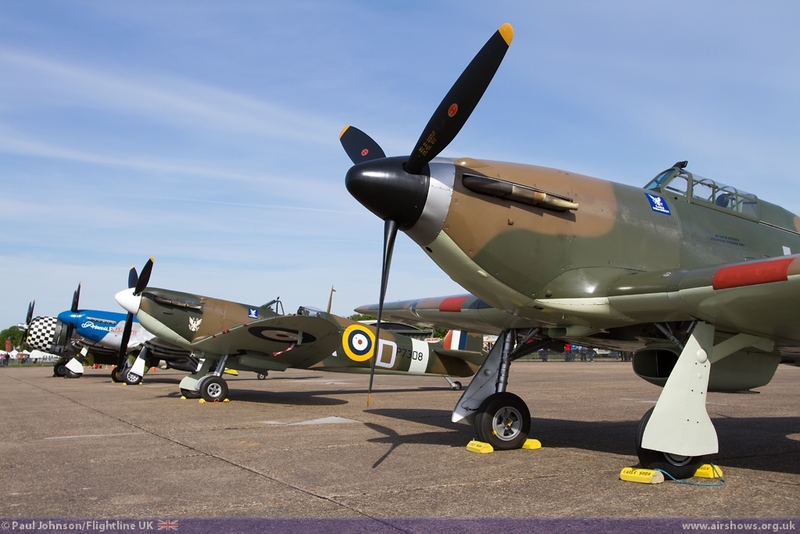 Flying from Tangmere, Billy was killed after nursing a damaged Hurricane back to Tangmere; he landed safely but the aircraft exploded. He survived with severe burns but later died of shock in hospital. 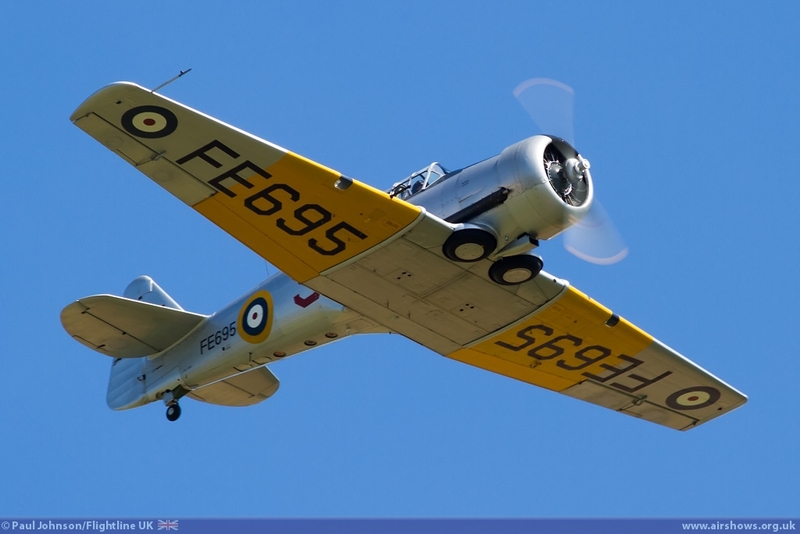 Carl Davis had in first taste of combat flying Blenheims in November 1939. 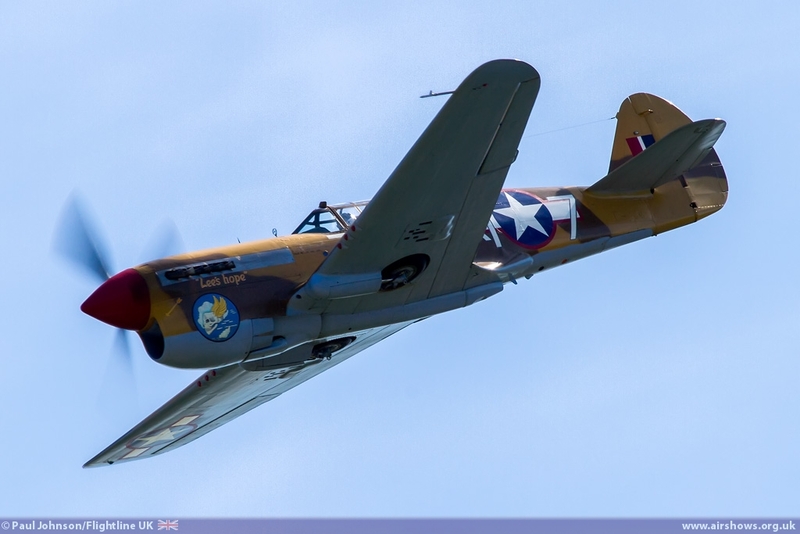 He stayed with the Squadron when it re-equipped with Hurricanes and amassed nine and half kills. 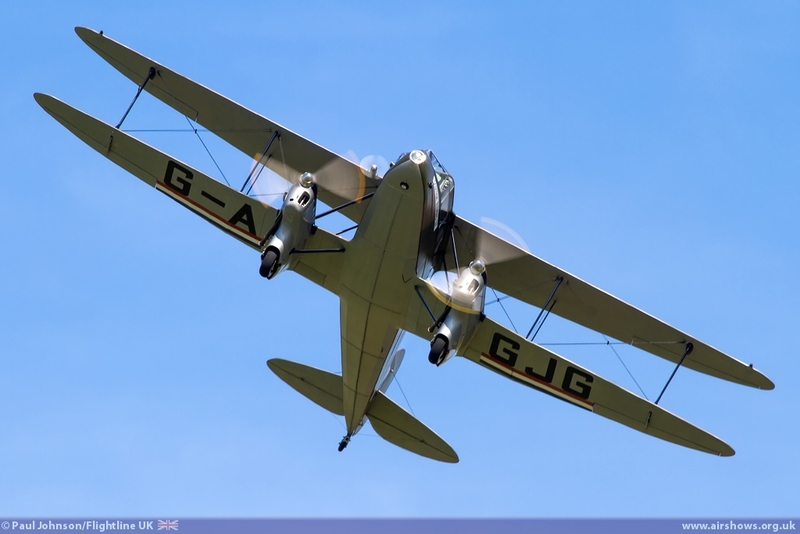 He was killed on the 6th September 1940 when he was shot down and crashed at Matfield. Both Billy and Carl were 29 years old. 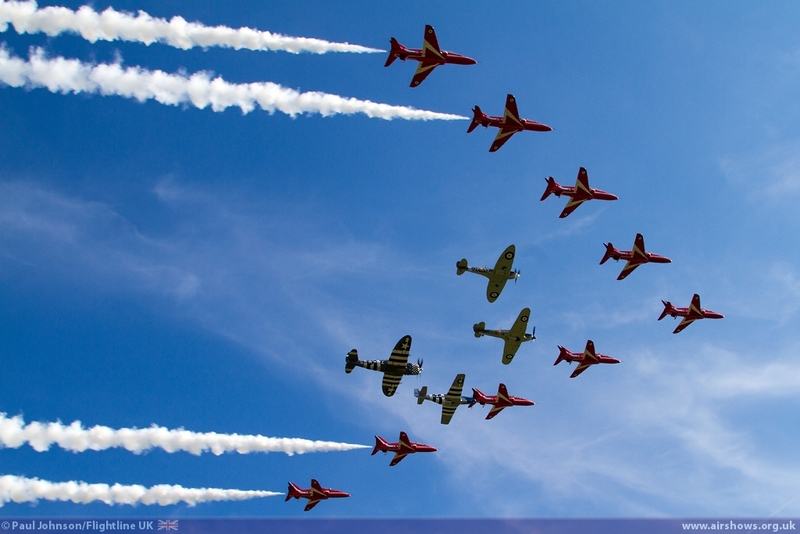 It was highly appropriate that the Eagle Squadron was flown by a mix of British and American pilots. 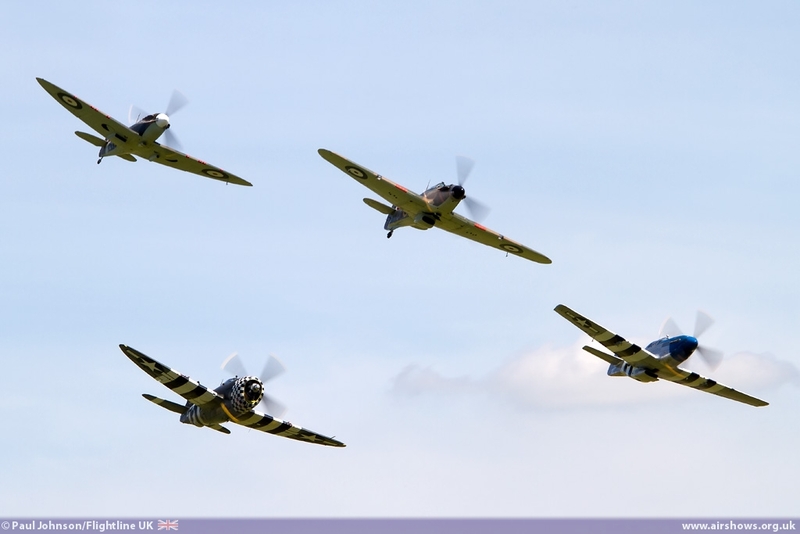 Leading the formation was Paul Bonhomme in the Hurricane. 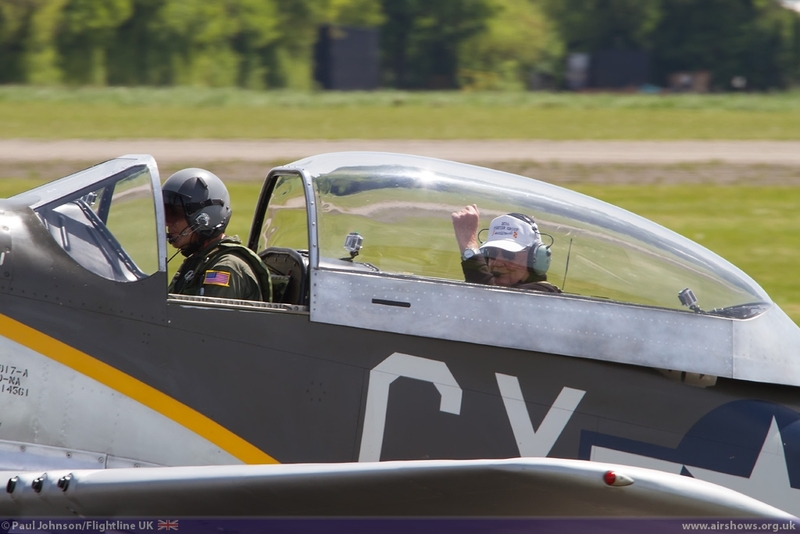 He was joined by American display pilots from the Horsemen Flight Team Dan Friedkin, Ed Shipley and Steve Hinton. 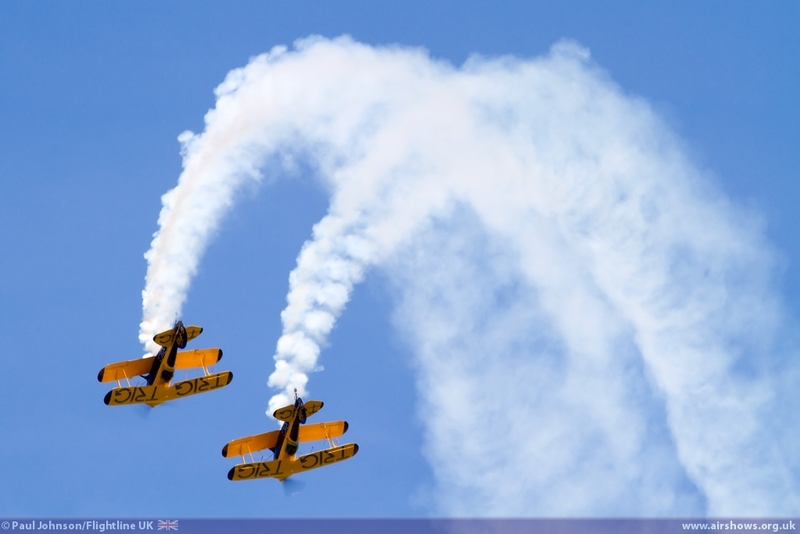 The Eagle Squadron opened the show first with a missing man formation followed by a minutes silence to remember the American airmen who served with the USAAF during the European campaign. 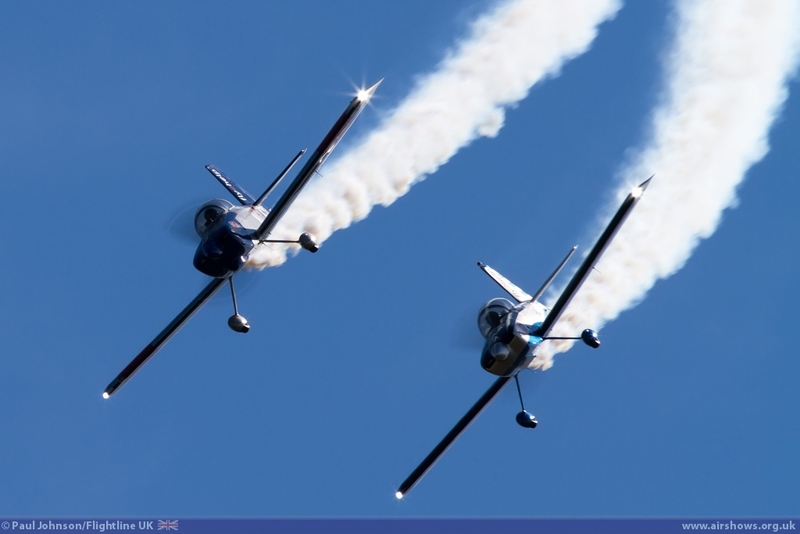 They returned to open the flying proper with a number of formation passes before splitting into formation pairs for some aerobatics in the clear blue skies. 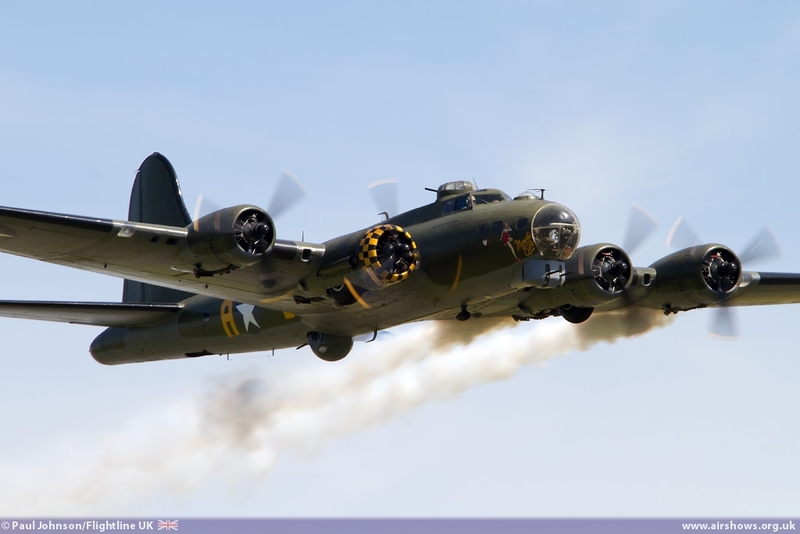 To complete the opening sequence they reformed on B-17G Flying Fortress Sally-B for an emotive final flypast before landing and leaving the stage clear for the B-17’s solo display. 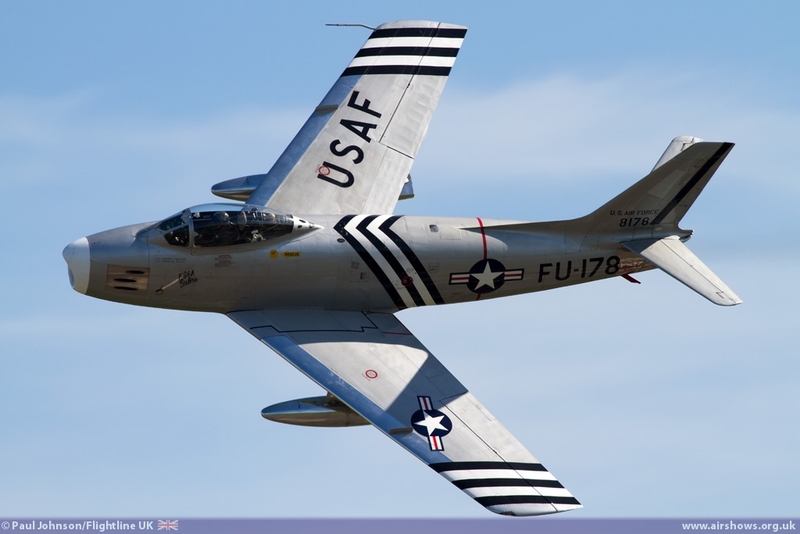 There were also a number of types included that you perhaps would not immediately think of as 8th Air Force aircraft. 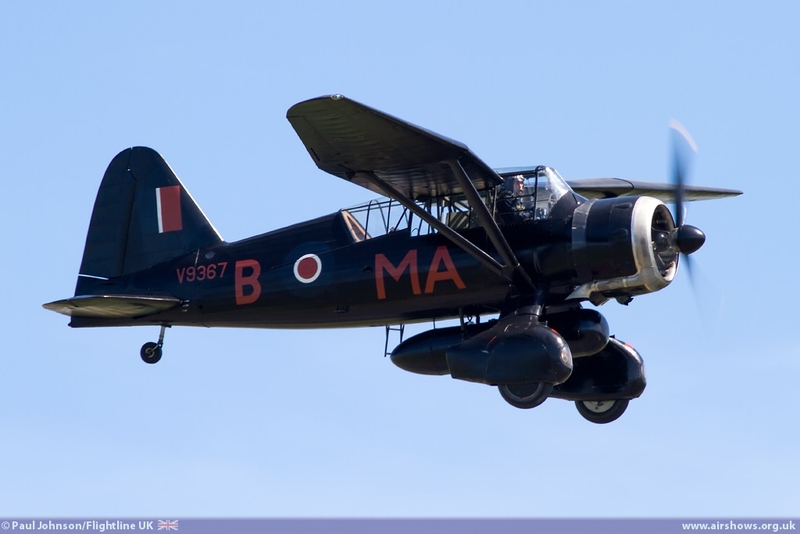 The Shuttleworth Collection's Westland Lysander represented the Lysanders that were transferred to the 8th for Target Towing duties while Mark Miller displayed the De Havilland Dragon Rapides which was used as liaison aircraft. 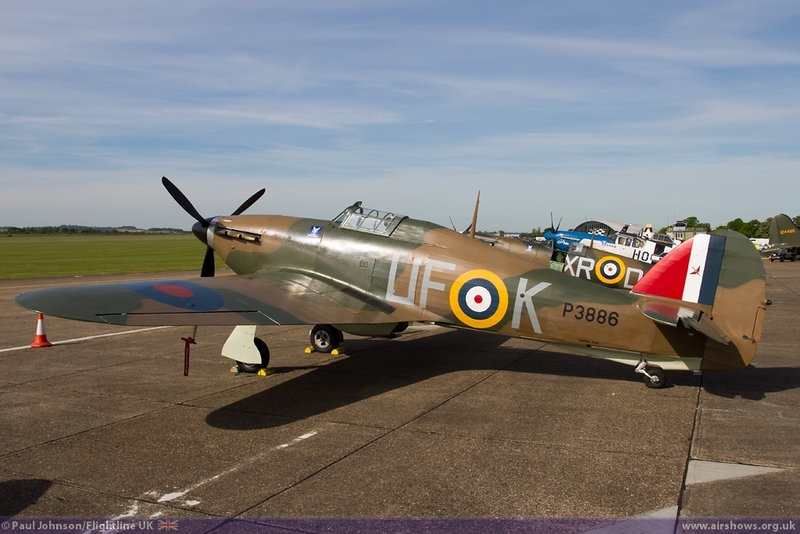 No Duxford display would be complete without some Spitfires and Richard Grace displayed Spitfire IXT alongside the Hispano HA-1112M1L Buchon flown by John Romain. 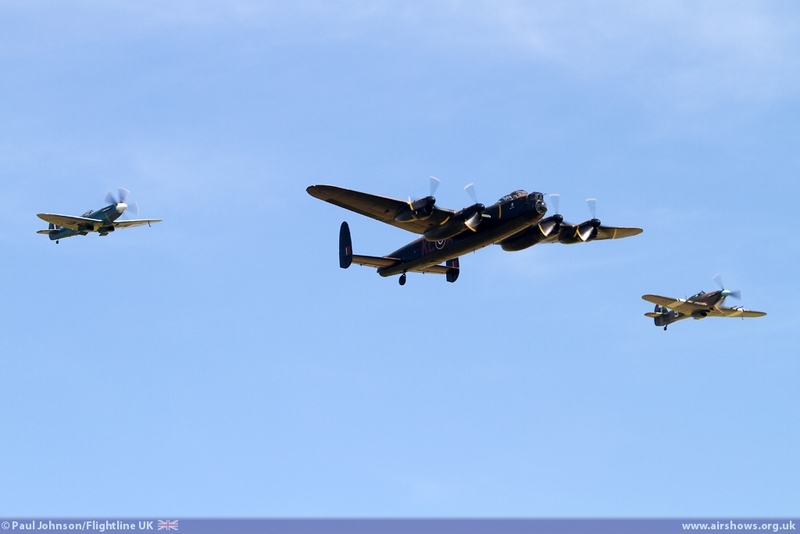 The Battle of Britain Memorial Flight are also long-time supporters of Duxford airshows and had their full complement of Lancaster, Spitfire and Hurricane on display. 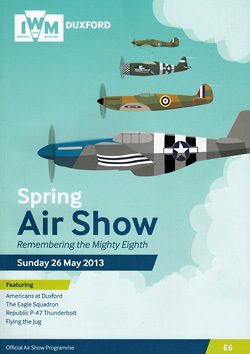 The 8th Air Force theme did not mean the show lacked variety with some great civilian acts on show. 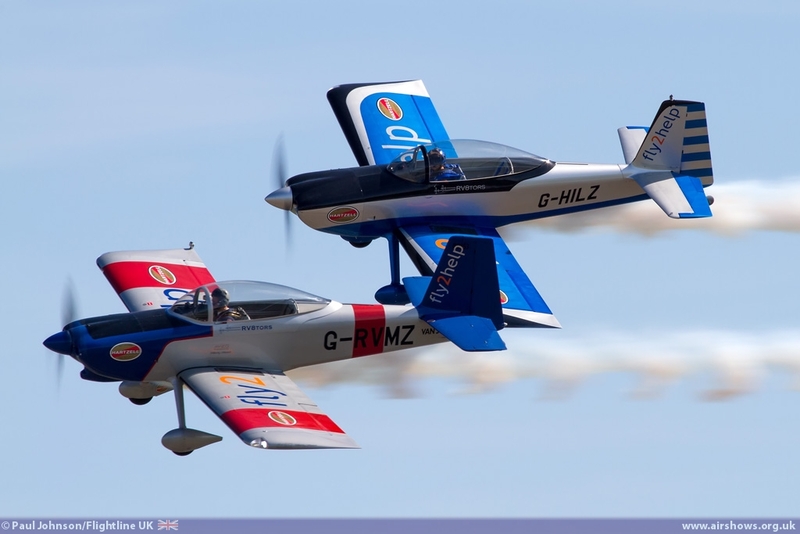 There were superb pairs displays from the TRIG Aerobatic Team flying a pair of Pitts S-1D Specials and the RV8tors with a Vans RV8 duo. 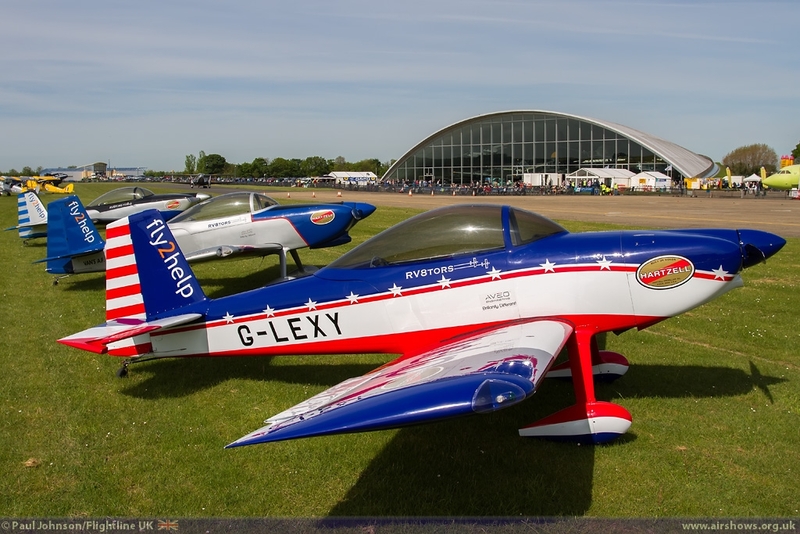 The RV8tors also for the first time had all three of their colourful aircraft on the flight-line. There was also a fine solo display by Steve Hicks and Sarah Tanner of the Breitling Wingwalkers to add a bit of glamour to proceedings. 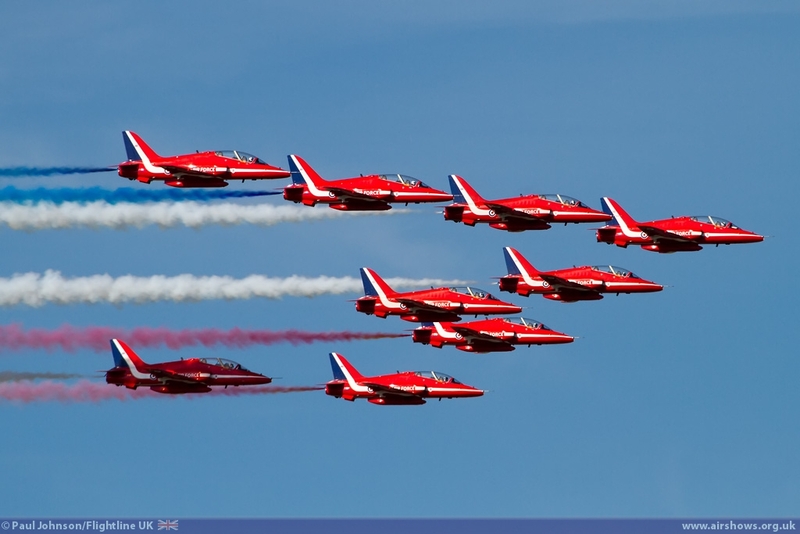 Sadly, the modern day Royal Air Force solos were not present. 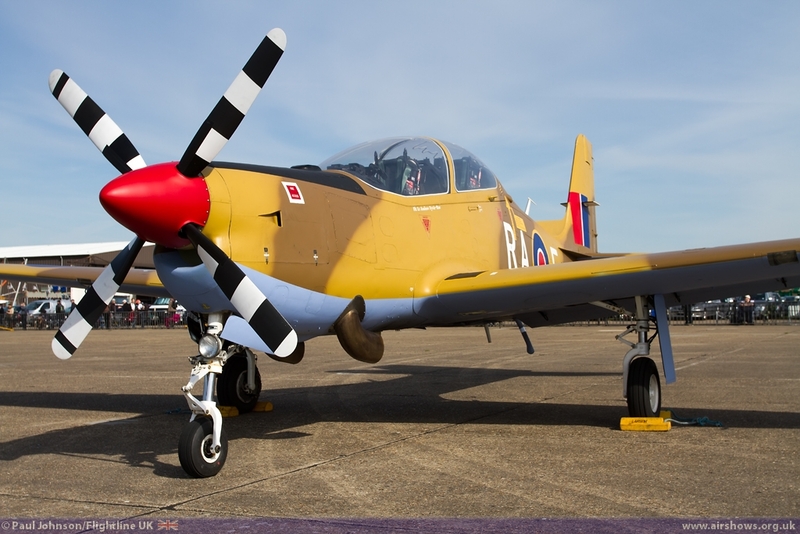 Only the Shorts Tucano T1 had been due to display, but the team was unable to secure its Public Display Authorisation in time for Duxford so only appeared on static display. 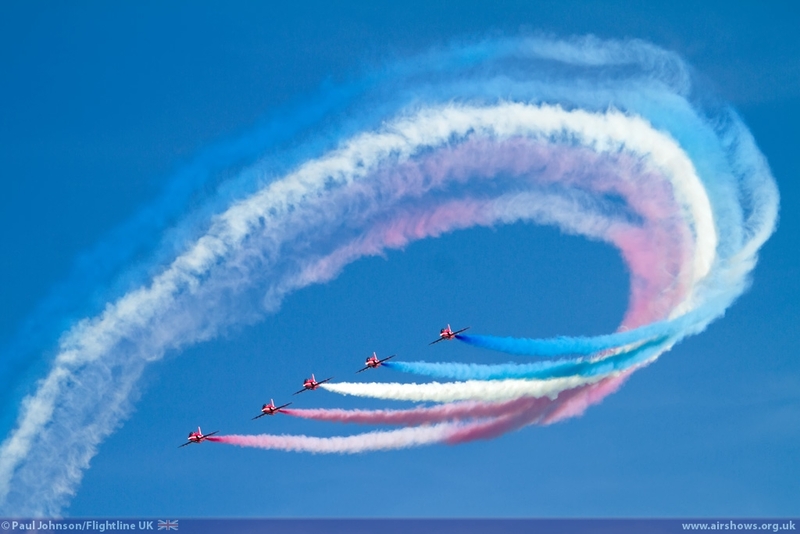 However there was some jet action. 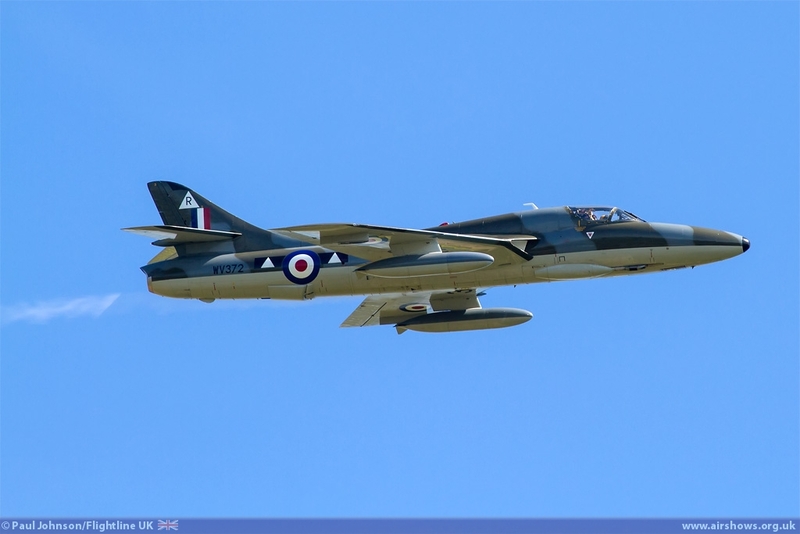 First Chris Heames displayed Graham Peacocks Hawker Hunter T7 from North Weald while later in the afternoon Mark Linney continued the American theme with the first public North American F-86A Sabre display for over a year. The opening of the show had been spectacular, but the finale really was something to savour. 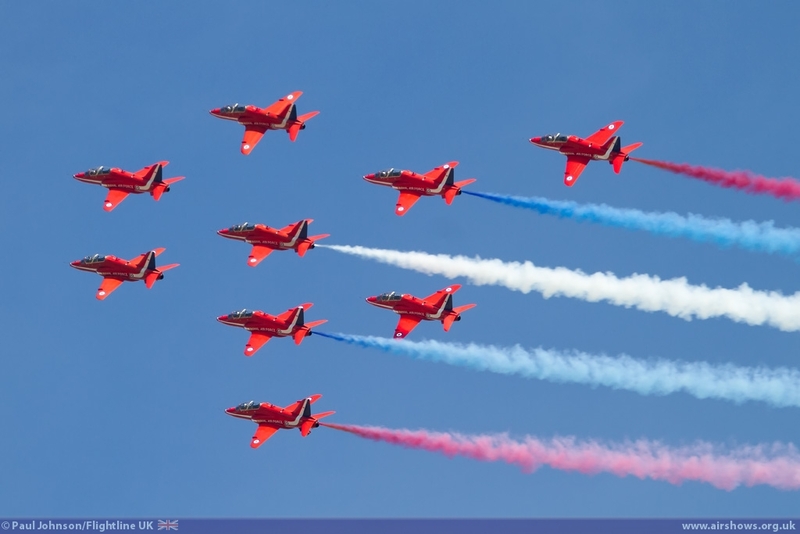 Once again the Eagle Squadron took to the skies, but this time headed east to Bury St Edmunds to form up with the Red Arrows who have just return from their Springhawk deployment to Cyprus. 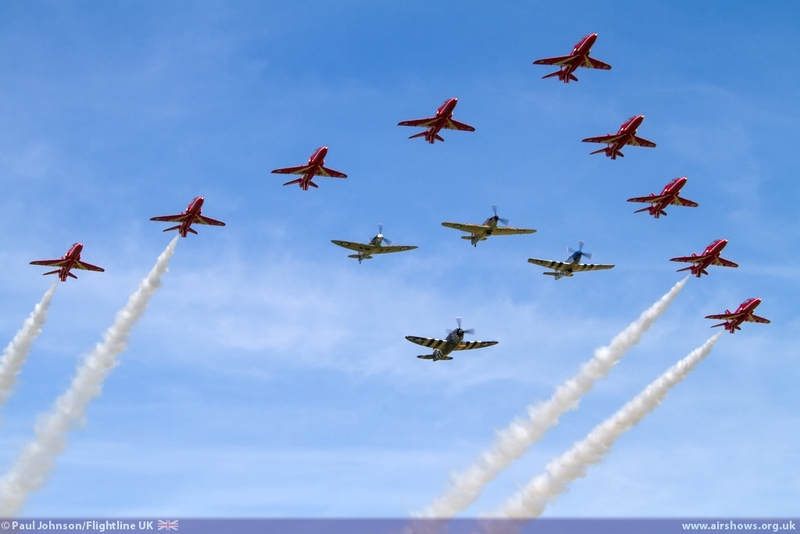 When the formation returned it was an awesome sight with the nine Red Arrows low and slow in Big Battle formation and the four warbirds tucked closely behind the lead aircraft. 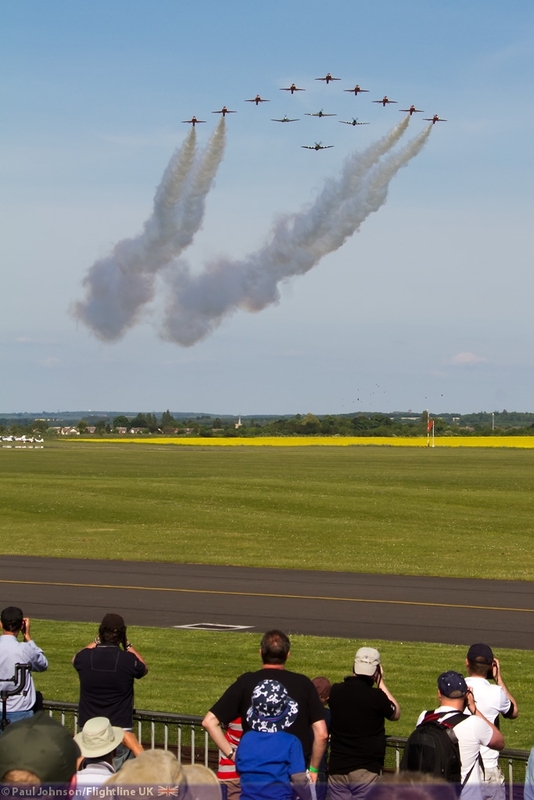 The piston engines downed out the jets as the formation passed over the airfield with the outside Reds streaming white smoke and the crowd almost silent with just the constant chatter of camera shutters capturing an amazing airshow moment! 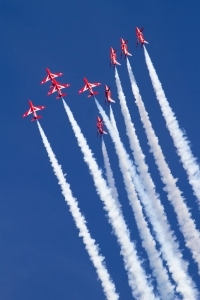 As the passed over the airfield the fighters peeled away to land while the Red Arrows prepared for their first UK display of the season. 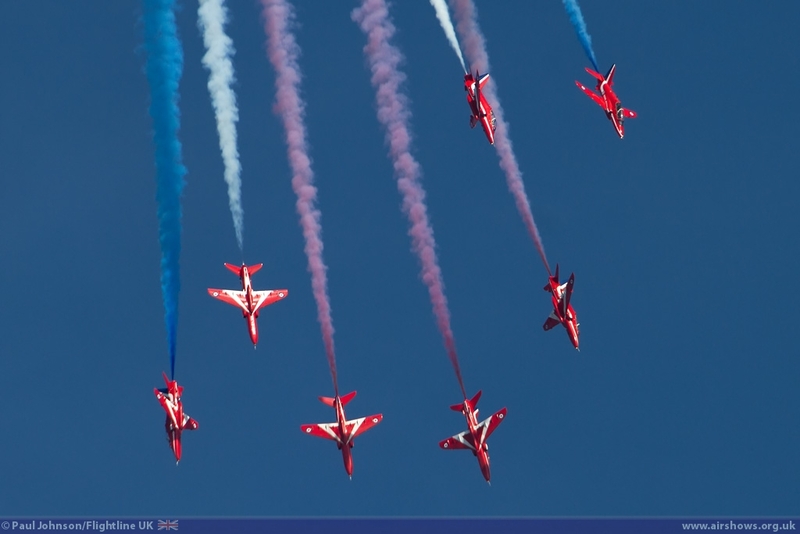 The 2013 Red Arrows display is back up to nine aircraft and contains a number of old favourites, but also some new figures including the five-four cross – it is great to see the team back and in full strength. 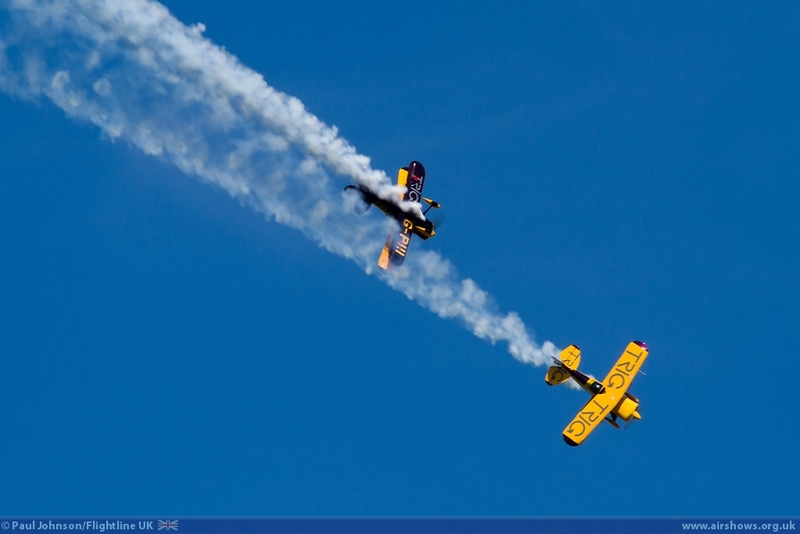 The Spring Air Show was an incredible show not only full of great flying, but had emotion and a great atmosphere. 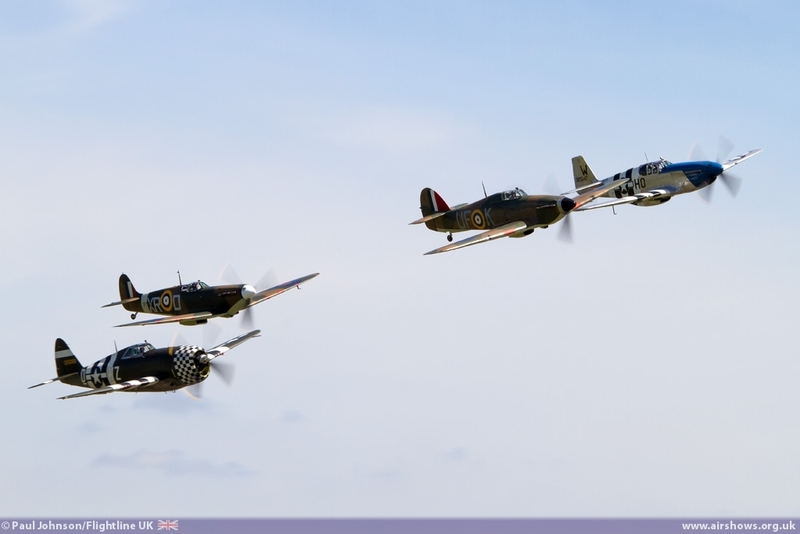 It was very much Duxford at its best.